For assessment of the independent renoprotective effect of BP control and angiotensin-converting enzyme inhibitor (ACEi) therapy, the relationships of baseline BP, BP reduction, and follow-up BP with the incidence of persistent microalbuminuria were evaluated in 1204 hypertensive patients who had type 2 diabetes and normoalbuminuria and were included in the BErgamo Nephrologic Diabetic Complications Trial (BENEDICT) study and were randomly assigned to 3.6 yr of treatment with the ACEi trandolapril (2 mg/d), the nondihydropyridine calcium channel blocker (ndCCB) verapamil SR (240 mg/d), their fixed combination Veratran (trandolapril 2 mg/d plus verapamil SR 180 mg/d), or placebo, plus other antihypertensive medications targeted at systolic/diastolic BP <130/80 mmHg. 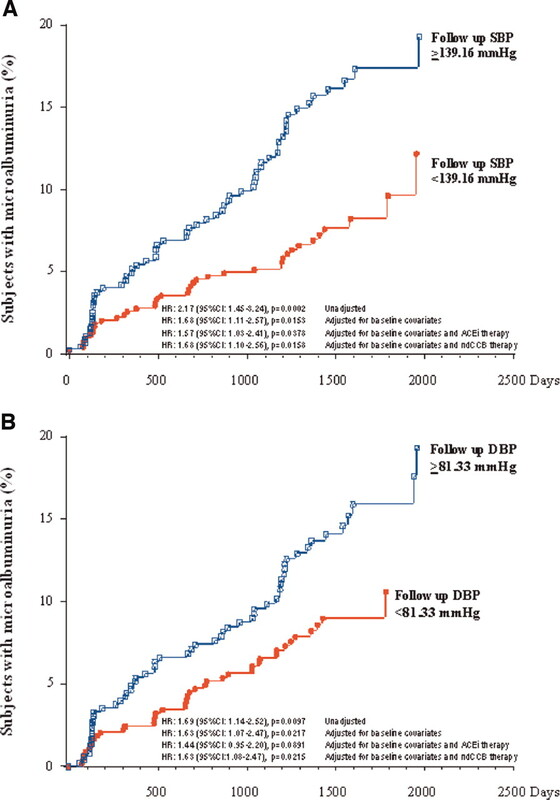 Follow-up (from month 3 to study end) systolic, diastolic, mean, and pulse BP and their reductions versus baseline—but not baseline BP—independently predicted (P < 0.001) the risk for microalbuminuria. 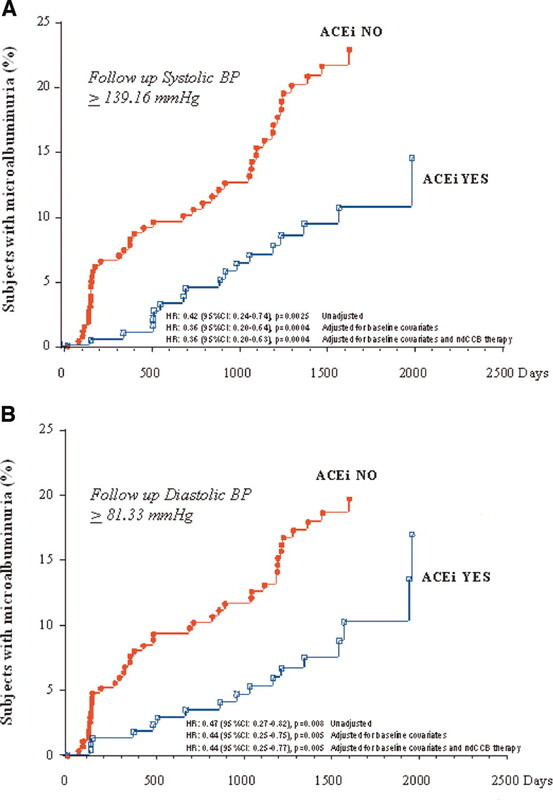 In patients with follow-up BP above medians, ACEi significantly reduced the risk for microalbuminuria to levels that were observed among patients with BP below medians, regardless of ACEi treatment. The same trend was observed among patients with BP reductions below medians. ndCCB therapy did not independently affect microalbuminuria. Patients who were on Veratran had lower BP and less frequently received diuretics, β blockers, or dihydropyridine dCCB. In hypertensive, normoalbuminuric patients with type 2 diabetes, BP reduction and ACEi therapy both independently may prevent microalbuminuria. ACEi therapy is particularly effective when BP is poorly controlled, whereas ndCCB therapy is ineffective at any level of achieved BP. As compared with trandolapril, Veratran may help with achievement of target BP with less need for concomitant antihypertensive medications. Patients with type 2 diabetes and hypertension have a seven-fold greater risk for progressing to ESRD and a two- to four-fold greater risk for developing cardiovascular sequelae, such as myocardial infarction, stroke, or death, as compared with age-matched control subjects and with patients with type 2 diabetes but normal BP (1,2). In patients who had type 2 diabetes and overt nephropathy and were enrolled in the Reduction of Endpoints in NIDDM with the Angiotensin II Antagonist Losartan (RENAAL) study and in the Irbesartan Diabetic Nephropathy Trial (IDNT), there was a significant relationship between the BP levels that were achieved during the follow-up period and the incidence of ESRD or cardiovascular events (3,4). Although at any level of achieved BP the overall incidence of events was consistently lower in patients on angiotensin II receptor blocker (ARB) than in those who were on placebo treatment, it also was apparent that the impact of achieved BP on clinical outcomes was independent of patient allocation to ARB or placebo treatment and was consistent within each treatment group (5). In patients with type 2 diabetes and established nephropathy, both renin-angiotensin-system (RAS) inhibition and BP control have specific and probably additive reno- and cardioprotective effects that may contribute to limit the excess renal and cardiovascular risk via different pathways. Whether this applies also to patients with type 2 diabetes but still no evidence of renal disease is not established so far. The Bergamo Nephrologic Diabetic Complications Trial (BENEDICT) found that in patients with type 2 diabetes, arterial hypertension, and normoalbuminuria, angiotensin-converting-enzyme inhibitor (ACEi) therapy with trandolapril plus verapamil or trandolapril alone delayed the onset of microalbuminuria, which is a major risk factor for renal and cardiovascular events in this population (6). Finding that this effect was significant even after adjustments for baseline and follow-up systolic (SBP) and diastolic BP (DBP) provided the evidence of a specific renoprotective effect of ACEi therapy against the development of microalbuminuria that was independent of the level of achieved BP control. However, whether and to which extent the achieved BP control also had an independent beneficial impact on clinical outcomes was not evaluated. 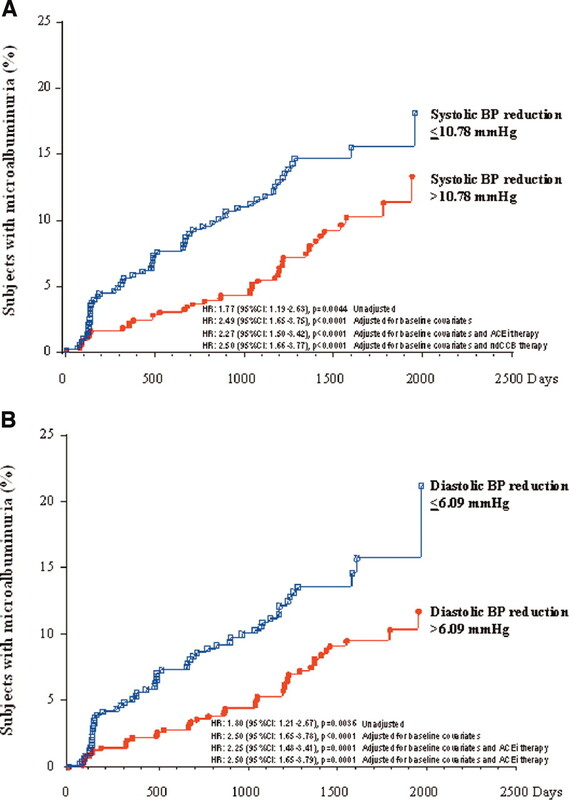 If BP reduction per se were renoprotective, then this would provide a strong rationale for intensified BP control in patients with type 2 diabetes. One has to take into account, however, that achieving and maintaining the recommended targets (7) often is difficult in patients with diabetes and may require two or more antihypertensive medications in most cases (6,8,9). In this post hoc analysis of the BENEDICT data, we investigated first whether effective BP control may reduce the risk for microalbuminuria in patients with type 2 diabetes and no evidence of renal disease and second whether this beneficial effect is enhanced when BP control is achieved by ACEi therapy with trandolapril plus verapamil or trandolapril alone. This study is based on a post hoc analysis of data from the BENEDICT trial. Study design and patient characteristics have been described in detail elsewhere (6,10,11). In short, BENEDICT was a prospective, randomized, double-blind, parallel-group study that evaluated the possibility of preventing the onset of persistent microalbuminuria in 1204 patients who had type 2 diabetes (World Health Organization criteria), arterial hypertension (SBP or DBP >130 or 85 mmHg, respectively, or concomitant antihypertensive therapy), but normal urinary albumin excretion (UAE) rate (UAE <20 mg/min in at least two of three consecutive overnight urine collections) and were randomly assigned to at least 3 yr of treatment with one of the following study drugs: (1) A nondihydropyridine calcium channel blocker (ndCCB), verapamil SR, 240 mg/d; (2) an ACEi, trandolapril 2 mg/d; (3) the combination of verapamil SR 180 mg/d plus trandolapril 2 mg/d, Veratran; and (4) placebo. The target BP after randomization and throughout the whole study period was <130/80 mmHg for all of the treatment groups. Other antihypertensive drugs (with the exception of RAS inhibitors and ndCCB that were different from the study drugs) could be used to achieve and maintain the target BP according to predefined guidelines (6,10,11). The study protocol was in accordance with the Declaration of Helsinki and was approved by the institutional review board at each center and by the safety committee of the BENEDICT study. All patients gave written informed consent. Data showed that, as compared with placebo, Veratran and trandolapril delayed the onset of microalbuminuria by factors of 2.6 and 2.1, respectively, whereas verapamil had no significant effect (6,11). The incidence of microalbuminuria versus placebo was reduced by 60% (hazard ratio [HR] 0.39; 95% confidence interval [CI] 0.21 to 0.73) with Veratran and by 50% with trandolapril (hazard ratio 0.49; 95% CI 0.27 to 0.90) but was not affected appreciably by verapamil. Our analysis was aimed primarily at evaluating whether BP at study entry (baseline BP), the mean BP control achieved from 3 mo after randomization to study end (follow-up BP), and the extent of BP reduction achieved from baseline to follow-up BP predicted the time to onset of persistent microalbuminuria in hypertensive patients who had type 2 diabetes and were included in the BENEDICT study. Secondarily, the analyses evaluated the incidence of microalbuminuria in various strata of baseline BP, follow-up BP, and BP reduction according to concomitant ACEi or ndCCB therapy. The main outcome variable was time to onset of persistent microalbuminuria (UAE ≥20 mg/min in at least two of three consecutive overnight urine collections confirmed after approximately 2 mo, again in at least two of three consecutive overnight urine collections). UAE was measured at randomization and every 6 mo up to study end. All UAE measurements were performed by nephelometry in the Laboratories of the Clinical Research Center for Rare Diseases “Aldo & Cele Daccò,” of the Mario Negri Institute for Pharmacologic Research. Trough SBP and DBP (Korotkoff phase I/V) BP were measured in the morning before treatment administration with the use of an appropriate cuff with a sphygmomanometer and the patient in the sitting position after at least 5 min of rest. Three measurements to the nearest 2 mmHg were obtained 2 min apart at each time point, and the average of the three measurements was recorded for the statistical analyses. The pulse pressure was calculated as the difference between SBP and DBP, and the mean arterial pressure (MAP) was calculated as the diastolic BP plus one third of the pulse pressure. Patients were included in these analyses only when they had, in addition to baseline BP evaluation, at least one BP measurement at the 3-mo visit or thereafter, so relative risk for development of microalbuminuria was computed conditional on survival. Among patients who still were in the trial after the 3-mo visit, all microalbuminuria events from randomization to death or censorship were included in the analyses. For outcome analyses, SBP and DBP measurements were included separately in the model. Therefore, for each measurement, we considered the median values of baseline BP, follow-up BP, and corresponding absolute reductions from baseline to follow-up BP. Then patients were stratified into two strata according to BP values above or below the corresponding medians. BP variables were considered as continuous variables or, alternatively, were dichotomized in two classes (below and above the median value). To incorporate time-dependent covariates, we used proportional hazards models instead of the accelerated failure time model that was used for the primary analysis. The HR and their 95% CI were determined using Cox proportional hazards models. Unadjusted models included the BP variable of interest only. Adjusted models included predefined baseline covariates (center, age, gender, smoking, and baseline log-transformed UAE) and the BP variable of interest. A further explorative model included these covariates and the randomization to ACEi or CCB therapy (yes or no). A sensitivity analysis also was performed by using time-dependent covariates to confirm study results. Continuous variables were compared by unpaired t test or Wilcoxon rank sum tests. Categorical variables that are shown in Table 1 were compared by log-rank text; those that are shown in Table 2 were compared by χ2 tests or Fisher Exact test. All of the statistical analyses were performed using SAS version 8.2 (SAS Institute, Cary, NC). P < 0.05 was considered as statistically significant. No P value adjustment was carried out for multiple comparisons. Of the 1204 patients in the original study cohort, 24 had no BP measurements at the 3-mo visit or at subsequent visits because they either reached an end point or stopped regular study follow-up for other reasons and were excluded from further analyses. Overall, the baseline SBP/DBP of the remaining 1180 patients was 150.9 ± 14.05/87.5 ± 7.66 mmHg and decreased by 6.5 ± 7.63/6.4 ± 7.47% to 140.5 ± 11.23/81.6 ± 5.74 mmHg on follow-up. Baseline MAP and pulse pressure were 108.6 ± 8.33 mmHg and 63.3 ± 12.64 mmHg, respectively; they decreased by 6.5 ± 6.83 and 5.3 ± 14.70% to 101.2 ± 6.47/58.9 ± 9.99 mmHg, respectively, on follow-up. In the unadjusted and adjusted Cox regression, baseline SBP, DBP, MAP, and pulse pressure failed to predict the onset of microalbuminuria. Patients with SBP or DBP above the medians tended to have a higher incidence of microalbuminuria as compared with those with lower BP, but differences between strata were not statistically significant (Table 1). Within each stratum at baseline, patients who subsequently were randomly assigned to ACEi therapy with trandolapril plus verapamil or trandolapril alone had a lower incidence of microalbuminuria than did patients who were on non-RAS inhibitor therapy (Table 1). Regardless of BP strata, there were no significant differences in the incidence of microalbuminuria between patients who were or were not on ndCCB therapy. Patients who developed microalbuminuria had significantly higher SBP, DBP, and MAP than those who did not develop microalbuminuria. A similar, nonstatistically significant difference was observed for pulse BP (Table 3). In the unadjusted and adjusted Cox regression models, higher follow-up SBP (unadjusted HR 1.05 [95% CI 1.03 to 1.07; P < 0.0001]; adjusted HR 1.04 [95% CI 1.02 to 1.06; P = 0.0002]), DP (unadjusted HR 1.06 [95% CI 1.02 to 1.11; P = 0.0015]; adjusted HR 1.05 [95% CI 1.01 to 1.10; P = 0.0085]), MAP (unadjusted HR 1.09 [95% CI 1.05 to 1.13; P < 0.0001]; adjusted HR 1.07 [95% CI 1.03 to 1.10; P = 0.0004]), and pulse BP (unadjusted HR 1.04 [95% CI 1.02 to 1.06; P = 0.0002]; adjusted HR 1.03 [95% CI 1.01 to 1.06; P = 0.0075]) all predicted an increased risk for microalbuminuria. The associations between considered BP and microalbuminuria all were statistically significant even after adding to the predefined baseline covariates the randomization to ACEi versus non-ACEi or to ndCCB versus non-ndCCB therapy (data not shown). The incidence of microalbuminuria was significantly higher in those with follow-up SBP, DBP, MAP, or pulse BP above the medians as compared with those with lower BP (Table 1). The excess risk for microalbuminuria associated with follow-up SBP above the median was significant even after adjustment for predefined baseline covariates and concomitant ACEi or ndCCB treatment (Figure 1A). The excess risk that was associated with DBP above the median was significant after correction for baseline covariates and concomitant ndCCB therapy but failed to achieve the statistical significance after adjustment for concomitant ACEi therapy (Figure 1). Similar trends were observed for follow-up MAP and pulse pressure (data not shown). Of interest, patients with SBP, DBP, MAP, and pulse BP below the medians as compared with those with corresponding BP above the medians more frequently were on ACEi therapy with trandolapril plus verapamil or trandolapril alone and, on the contrary, were less frequently on treatment with concomitant antihypertensive medications such as diuretics, β blockers, dCCB, and sympatholytic agents (Table 2). In BP strata above the medians, patients who were on ACEi therapy had a significantly lower incidence of microalbuminuria than those who were on non-ACEi therapy, whereas in BP strata below the median, the incidence of events on ACEi or non-ACEi therapy was comparable (Table 1). Of note, the incidence of microalbuminuria in patients who were on ACEi therapy with BP above the medians was decreased to levels that were comparable to those that were observed in patients with lower BP, regardless of treatment randomization. The risk reduction that was achieved by ACEi therapy in patients with follow-up SBP or DBP above the median was highly significant even after adjustment for baseline covariates and concomitant treatment with ndCCB (Figure 2). Regardless of BP strata, there were no significant differences in the incidence of microalbuminuria between patients who were or were not on ndCCB therapy (Table 1). Patients who developed microalbuminuria throughout the study period according to follow-up systolic BP (SBP; A) or diastolic BP (DBP; B) above or below the median. Patients who had follow-up SBP (A) or DBP (B) above the median and developed microalbuminuria throughout the study period according to concomitant angiotensin-converting enzyme inhibitor (ACEi) therapy (yes or no). Patients who developed microalbuminuria had a significantly lower reduction in SBP as compared with those who did not develop microalbuminuria. Similar differences were observed for reductions in DBP, MAP, and pulse BP (Table 3), which, however, did not reach statistical significance. In the unadjusted and adjusted Cox regression models, more consistent reductions in SBP (unadjusted HR 1.03 [95% CI 1.02 to 1.05; P = 0.0001]; adjusted HR 1.05 [95% CI 1.03 to 1.07; P < 0.0001]), DBP (unadjusted HR 1.05 [95% CI 1.02 to 1.08; P = 0.0018]; adjusted HR 1.07 [95% CI 1.04 to 1.10; P < 0.0001]), MAP (unadjusted HR 1.05 [95% CI 1.03 to 1.08; P = 0.0001]; adjusted HR 1.08 [95% CI 1.05 to 1.11; P < 0.0001]) and pulse BP (unadjusted HR 1.03 [95% CI 1.01 to 1.05; P = 0.0095]; adjusted HR 1.04 [95% CI 1.02 to 1.06; P = 0.0008]) all predicted a decreased risk for microalbuminuria. The associations between considered changes in BP and microalbuminuria were significant even adding to the predefined baseline covariates the randomization to ACEi versus non-ACEi or to ndCCB versus non-ndCCB therapy (data not shown). The incidence of microalbuminuria was significantly higher in those with reductions in follow-up SBP, DBP, MAP, or pulse BP below the medians as compared with those with more BP reductions (Table 1). Baseline characteristics of patients with SBP reduction above or below the median were similar (Table 4), with the only exception of gender distribution and BP (more women and higher BP in those with SBP reduction above the median). In patients with more BP reduction, there also was a nonsignificant trend to lower body mass index, whereas baseline glycosylated hemoglobin, lipids, and albuminuria were virtually identical in the two groups. The excess risk for microalbuminuria that was associated with SBP and DBP reduction below the median was significant even after adjustment for predefined baseline covariates and concomitant ACEi or ndCCB treatment (Figure 3). Similar trends were observed for MAP and pulse pressure reduction below the medians (data not shown). Adjusted Cox regression models that did or did not include body mass index in addition to the predefined baseline covariates showed the same independent association between SBP reduction and microalbuminuria (HR 1.05; 95% CI 1.03 to 1.07; P < 0.0001). Of interest, patients with SBP, DBP, MAP, and pulse BP reduction above the medians as compared with those with corresponding BP reductions below the medians more frequently were on ACEi therapy with trandolapril plus verapamil or trandolapril alone and, on the contrary, less frequently were on treatment with concomitant antihypertensive medications such as diuretics, β blockers, dCCB, and sympatholytic agents (Table 5). Patients who developed microalbuminuria throughout the study period according to follow-up SBP (A) or DBP (B) reduction above or below the median. Among patients with BP reductions below the medians, those who were on ACEi therapy had a significantly lower incidence of microalbuminuria than those who were on non-ACEi therapy, whereas among those with BP reductions above the medians, the incidence of events on ACEi or non-ACEi therapy was comparable (Table 1). Of note, the incidence of microalbuminuria in patients who were on ACEi therapy with BP reductions below the medians was decreased to levels that were comparable to those that were observed in patients with BP reductions above the medians, regardless of treatment randomization. The risk reduction that was achieved by ACEi therapy in patients with SBP (Figure 4A), MAP, and pulse pressure (data not shown) below the median was significant even after adjustment for baseline covariates and concomitant treatment with ndCCB. A similar trend was observed for DBP, but risk reduction was NS after the previous adjustments (Figure 4B). Regardless of BP strata, there were no significant differences in the incidence of microalbuminuria between patients who were or were not on ndCCB therapy (Table 1). Patients who had follow-up SBP (A) or DBP (B) reduction below the median and developed microalbuminuria throughout the study period according to concomitant ACEi therapy (yes or no). As compared with patients with follow-up BP above the medians, patients with follow up BP below the medians more frequently were on ACEi therapy, in particular with the trandolapril plus verapamil combination, and less frequently on concomitant treatment with diuretics, β blockers, dCCB, and sympatholytic agents. On the contrary, patients with follow-up BP above the medians more frequently were on verapamil or placebo and more frequently required treatment with concomitant BP-lowering medications, in particular with diuretics, dCCB, and sympatholytic agents. As compared with patients with BP reduction below the medians, patients with BP reductions above the medians more frequently were on ACEi therapy, in particular with the trandolapril plus verapamil combination, and less frequently on concomitant treatment with diuretics, β blockers, dCCB, and sympatholytic agents. On the contrary, patients with BP reductions below the medians more frequently were on verapamil or placebo and more frequently required treatment with concomitant BP-lowering medications, in particular with diuretics, dCCB, and sympatholytic agents. Here we found that in patients with type 2 diabetes and arterial hypertension but normal urinary albumin excretion, effective BP reduction has a specific and independent protective effect against the development of microalbuminuria. 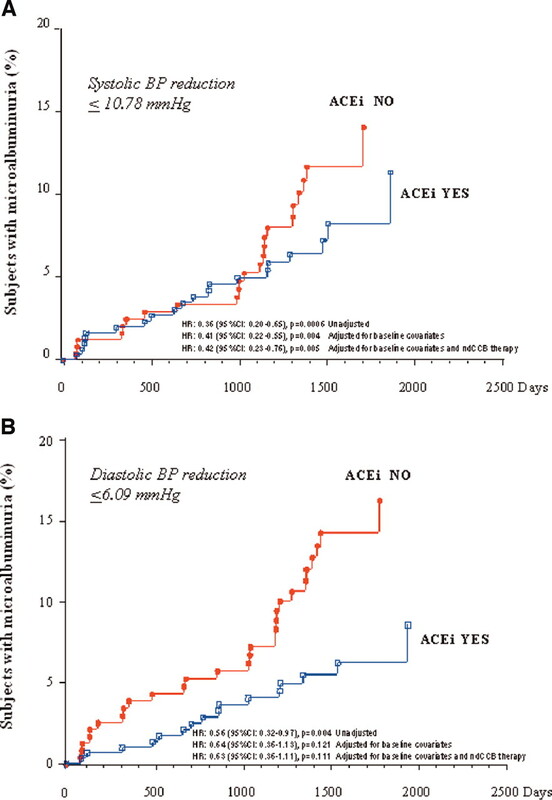 ACEi therapy has a further protective effect, in particular when the BP is poorly controlled, whereas ndCCB therapy is ineffective at any level of achieved BP. Finding that the risk for development of microalbuminuria was not associated with baseline BP provided consistent evidence that the lower incidence of microalbuminuria that was observed with more effective BP reduction reflected a benefit of treatment and not simply a less severe hypertension at study entry. Therefore, our findings extend to the very early stages of diabetic renal disease and previous evidence of renoprotective effect of BP control in people with diabetes and established nephropathy (3,5,11–13). All of the parameters that were considered in monitoring the BP throughout the trial—SBP, DBP, MAP, and pulse pressure—were significantly associated with the risk for microalbuminuria. SBP, however, appeared as the strongest risk predictor, and its reduction as the most protective factor against the development of microalbuminuria. This is consistent with previous evidence that SBP, more effectively than DP, MAP, or pulse pressure, predicted renal disease progression in patients with type 2 diabetes and overt nephropathy (5). Therefore, targeting SBP may increase the protective effect of antihypertensive therapy against the onset and progression of diabetic renal disease. A major practical problem, however, may limit the effectiveness of this strategy. The recommended target of 130 mmHg for SBP (7) seldom is achievable in patients with type 2 diabetes, even when several BP-lowering medications are used in combination (6,8,9). Sixty-two percent of BENEDICT patients received one or more antihypertensive drugs in addition to the study drugs, and low-sodium intake was recommended all of them. Despite this, only 14% of them achieved an SBP of 130 mmHg or less. The highest proportion of patients who were on target was observed among those who were on combined trandolapril plus verapamil treatment, who, notably, less frequently required concomitant treatment with other antihypertensive medications. This is consistent with our finding that the highest proportion of patients with SBP, DBP, MAP, and pulse pressure below the medians was observed among those who were on combined trandolapril and verapamil treatment who also less frequently required concomitant treatment with diuretics, β blockers, dCCB, and sympatholytic agents. Whether reducing the need for these medications may translate into long-term clinical benefit, however, remains to be addressed in ad hoc trials. For instance, diuretics may worsen insulin sensitivity, an effect that may increase the incidence of type 2 diabetes in those who are at risk (14), but also may increase the response to ACEi therapy and are less expensive than more recent drugs, such as dCCB. dCCB increase albuminuria and may accelerate renal disease progression in patients with diabetes or chronic renal disease, but these effects are limited when they are used in combination with ACEi or ARB (15,16). Data that BP has a specific and clinically relevant impact on renal disease progression largely are generated by observational studies that show a higher incidence of ESRD in particular in patients with severe and poorly controlled hypertension (17). A still debated issue, however, is whether BP has an independent predictive value also among patients with BP that is maintained at usual targets of diastolic <90 mmHg or mean <107 mmHg and whether further reduction to lower-than-usual targets (according to Seventh Report of the Joint National Committee on Prevention, Detection, Evaluation, and Treatment of High Blood Pressure guidelines: SBP/DBP <130/80 mmHg) may confer additional renoprotection. Whether treatment should target SBP, DBP, pulse pressure, or MAP also is far from being established in controlled studies. The first evidence that reducing BP to lower-than-usual targets (mean <92 mmHg) may slow the rate of GFR decline in chronic renal disease was generated by the Modification of Diet in Renal Disease (MDRD) study (18). As acknowledged by the authors, however, in this study, the proportion of patients who were on ACEi therapy was remarkably higher in the low-BP than in the usual-BP group. On the same line, the trial by Breyer-Lewis et al. (19) in type 1 diabetic nephropathy showed that patients with lower BP target (mean <92 mmHg) had an effective reduction in urinary proteins that, by contrast, progressively increased in those with usual target (mean 100 to 107 mmHg). Again, however, data were biased by the concomitant treatment with ACEi that were used at remarkably higher dosages in patients who were randomly assigned to lower BP target than in those patients who were randomly assigned to usual BP target. Three other trials that compared the effect of treatment that was targeted at two different BP levels on similar background RAS inhibitor therapy failed to detect any specific benefit of intensified BP control. The African American Study of Kidney Disease and Hypertension (AASK) found the same rate of GFR decline and the same course of proteinuria in patients in the low (mean <92 mmHg) or usual (mean 100 to 107 mmHg) BP group (20). The Appropriate Blood Pressure Control in Diabetes (ABCD) trial showed a similar time-dependent course of creatinine clearance in three large cohorts of patients who had type 2 diabetes and normo-, micro-, or macro- albuminuria and were randomly assigned to DBP <75 mmHg or 80 to 89 mmHg, respectively (21). Finally, the Ramipril Efficacy in Nephropathy (REIN)-2 study found the same rate of GFR decline, incidence of ESRD, and time-dependent course of proteinuria in two groups of patients with the same ACEi therapy but randomly allocated to low (SBP/DBP <130/80 mmHg) or usual (DBP <90 mmHg) BP targets (22). Notably, these studies targeted therapy to different parameters (MAP, DBP, or SBP), and none of them evaluated the impact of BP and its reduction on the risk for development of microalbuminuria. In this regard, the UK Prospective Diabetes Study (UKPDS) found a lower incidence of macrovascular complications and retinopathy in patients who had type 2 diabetes and were randomly assigned to intensified BP control but failed to detect a significant protective effect of lower BP against the risk for development of microalbuminuria (23). On the same line, the ABCD trial found a trend to a lower incidence of microalbuminuria in patients with type 2 diabetes and normal UAE who were allocated to the low BP group, but the risk reduction versus those in the usual BP group was NS. Therefore, our analysis provides the first evidence of an independent association between BP and risk for microalbuminuria and between BP reduction and reduced risk in people with diabetes and well-controlled hypertension. Of note, finding that baseline characteristics—including glycosylated hemoglobin, blood glucose, and lipids—of patients with BP reduction above or below the median were similar and did not affect the predictive value of BP suggests that our data were not confounded by concomitant patient characteristics that might have influenced individual response to antihypertensive therapy. Conversely, finding that the benefit of BP reduction was particularly consistent in patients who were predicted to be at increased risk because of more severe hypertension reinforced the possibility of a cause-and-effect relationship between more effective BP reduction and reduced incidence of microalbuminuria. This, however, could be proved definitely only by a prospective clinical trial in hypertensive patients who were on the same background RAS inhibitor therapy and randomly allocated to two different BP targets. Evidence that BP reduction and ACEi therapy may have an independent and additive protective effect against microalbuminuria is in harmony with current theories on the pathophysiology of diabetic renal disease (24). The impact of BP control on the risk for development of microalbuminuria reflects the specific vulnerability of the diabetic kidney to the barotrauma that is caused by arterial hypertension. Autoregulation of afferent arteriolar tone in response to changes in renal perfusion pressure is defective in diabetes (25), and decreased afferent arteriolar resistance facilitates the transmission of the systemic BP to the glomerular capillary, which increases intracapillary pressure (24,26). In the long term, these hemodynamic changes may cause endothelial dysfunction, impaired sieving function of the glomerular barrier, increased albumin ultrafiltration, and albuminuria (27). Therefore, reducing systemic BP to normal ranges is crucial to ameliorate glomerular hypertension and prevent glomerular damage. Glomerular hypertension also is ameliorated by drugs, such as ACEi or ARB, which dilate the efferent arteriole (26,28). The incremental benefit of this specific hemodynamic effect would be particularly relevant when arterial hypertension is not controlled effectively (29). This likely explains why, in our study, the beneficial effect of ACEi therapy against the development of microalbuminuria was more consistent in patients who had higher BP on follow-up. The specific benefit of ACEi therapy is confirmed by data from a meta-analysis of 16 trials that included 7603 patients with type 2 diabetes, hypertension, and normoalbuminuria and showed a 42% reduction in the risk for development of microalbuminuria with ACEi, whereas the effects of other antihypertensive medications did not differ from those of placebo (30). Given a 10% incidence of microalbuminuria in patients with diabetes and hypertension over 2 to 3 yr, approximately 25 people would need to be treated to prevent one more case of microalbuminuria (31). Because microalbuminuria is a strong predictor of kidney failure and cardiovascular morbidity/mortality, the specific protective effect of ACEi therapy against the development of microalbuminuria should be taken into consideration in treatment guidelines for the practicing physician (27,32). Indeed, most guidelines recommend any agent in patients with diabetes and hypertension and without nephropathy and only ACEi or ARB once nephropathy occurs (7). This largely rests on data from hypertension trials that showed that BP reduction limits cardiovascular morbidity and mortality regardless of the antihypertensive agent used to achieve the target BP and overlooks that only ACEi have been proved to reduce the onset of microalbuminuria in hypertensive patients with diabetes. Our data, consistent with previous evidence from BENEDICT (6) and other trials (30), provide the evidence that, compared with other agents, ACEi have an incremental benefit on renal outcomes and so should be the treatment of choice in hypertensive patients with diabetes. Effective BP control and ACEi therapy both are key components of renoprotective treatments that aim to prevent the development of microalbuminuria in patients with type 2 diabetes. The combination of an ACEi and an ndCCB may help in achievement of optimal BP control and effective inhibition of the RAS while limiting the need for concomitant antihypertensive medications that may adversely affect the metabolic control and the overall cardiovascular risk profile of people with diabetes. Whether an antihypertensive regimen that includes such a combination drug may effectively limit the excess morbidity and mortality that are associated with type 2 diabetes is worth investigating in prospective, randomized trials. The BENEDICT Study Organization: Principal Investigator, G. Remuzzi (Bergamo); Study Coordinator, P. Ruggenenti (Bergamo); Coordinating Center, Mario Negri Institute (MNI) for Pharmacologic Research–Clinical Research Center for Rare Diseases “Aldo e Cele Daccò,” Villa Camozzi, Ranica (Bergamo). Participating centers: G. Nastasi, A. Ongaro, F. Querci, A. Anabaya, (Alzano Lombardo); R. Trevisan, A.R. Dodesini, G. Lepore, I. Nosari, C.A. Aros Espinoza, A. Fassi (Bergamo); M. Songini, G. Carta, G. Piras (Cagliari); B. Minetti, P. Fiorina, G. Ghilardi, V. Grassia, E. Pezzali, E. Seghezzi, I. Villanova (Clusone); A. Spalluzzi, I. Codreanu, C. Flores (Ponte San Pietro, Villa d’Almè); C. Chiurchiu, F. Arnoldi, L. Mosconi, M. Monducci (Ranica); A. Bossi, M. Facchetti, V. Brusegan (Romano di Lombardia); F. Inversi, V. Bertone, R. Mangili, S. Bruno (Seriate); A. Bossi, A. Parvanova, I. Petrov Iliev, E. Terzieva (Treviglio). Ophthalmologists: M. Filipponi, I. Iliev, S. Tadini (Bergamo). Monitoring and drug distribution (MNI): G. Gherardi, N. Rubis, S. Birolini, L. Bruni, W. Calini, V.A. Carrasco Oyarzun, R. D’Adda, O. Diadei, M. Ferrari, L. Mangili, A. Milani, G. Noris, K. Pagani, S. Quadri, A. Rossi, S. Secomandi, G. Villa (Ranica). Carriers (MNI): G. Gaspari, S. Gelmi, G. Gervasoni, L. Nembrini (Ranica). Database and data validation (MNI): A. Remuzzi, B. Ene-Iordache, V. Gambara (Ranica). Data analysis (MNI): A. Perna, B.D. Dimitrov, M. Ganeva, J. Zamora (Ranica). Laboratory measurements (MNI): F. Gaspari, F. Carrara, E. Centemeri, S. Ferrari, M. Pellegrino, N. Stucchi (Ranica). Genomic evaluations (MNI): M. Noris, P. Bettinaglio, S. Bucchioni, J. Caprioli, B. Giussani (Bergamo). Regulatory affairs (MNI): P. Boccardo (Ranica). Steering committee: Voting members: S. Kupfer (Abbott Park), L. Minetti (Bergamo), G. Remuzzi (Bergamo); nonvoting members: U.F. Legler (Ludwigshafen), B. Kalsch (Ludwigshafen), D. Nehrdich (Ludwigshafen), A. Nicolucci (S. Maria Imbaro), A. Perna (Bergamo), P. Ruggenenti (Bergamo). Safety committee: G.L. Bakris (Chicago), R. Kay (Sheffield), G.C. Viberti (London). We thank Manuela Passera for help in preparing the manuscript. See the related editorial, “Prevention of Microalbuminuria in Type 2 Diabetes: Millimeters or Milligrams?” on pages 3276–3278. Prevention of Microalbuminuria in Type 2 Diabetes: Millimeters or Milligrams?